During humoral immune responses, naive B cells differentiate into Ab-secreting plasma cells within secondary lymphoid organs. Differentiating plasma cells egress from their sites of generation and redistribute to other tissues, predominantly the bone marrow and mucosal tissues. In this study, we demonstrate that within peripheral lymph nodes newly generated plasma cells localize to medullary cords which express the β2 integrin ligand ICAM-1. In β2 integrin-deficient mice plasma cells accumulate inside the lymph nodes, resulting in severely reduced plasma cell numbers in the bone marrow. Since plasma cells isolated from β2 integrin-deficient animals migrate efficiently into the bone marrow when transferred i.v., our findings provide profound evidence that β2 integrins are required for the egress of plasma cells from peripheral lymph nodes. Along with unique α subunits, β2 integrin (CD18) forms heterodimeric complexes known as LFA-1 (CD11a/CD18), Mac-1 (CD11b/CD18), gp150,95 (CD11c/CD18), and CD11d/CD18, respectively (1, 2). Deficiency of the β2-chain impairs the expression of all known heterodimeric β2 integrins. The importance of β2-mediated cell contacts is illustrated by a severe but rare human autosomal-recessive syndrome termed leukocyte adhesion deficiency type 1, which is caused by β2 deficiency (3). Following their generation in the lymph nodes (LN),3 long-lived Ab-secreting plasma cells (PC) migrate to the bone marrow (BM) or mucosal tissues, where they secrete IgG and IgA, respectively (reviewed in Refs. 4 and 5). Besides their well-known roles in B cell migration (6), chemokines and their receptors also contribute to specificity in PC trafficking. PC generated in the germinal centers of spleen and LN down-regulate the chemokine receptors CXCR5 and CCR7 (7, 8) but maintain CXCR4 and in vitro migrate toward the CXCR4 ligand CXCL12 (9, 10). In vivo CXCR4 was shown to be required for proper PC migration in the spleen and homing of PC to the BM (4, 7). Whereas migration of PC into inflamed tissues depends on CXCR3 (10), that of IgA-secreting PC into the small intestine depends on CCR9 (11). The finding that chemokine receptors regulate PC migration also suggests a contribution of integrins in PC migration by converting the chemokine signals into cell adhesiveness. In this study, we show that newly generated PC locate to ICAM-1+ medullary cords that constitute the exit point from the LN. Most important, PC accumulate in the LN of CD18−/− mice, resulting in decreased numbers of these cells in the BM. Interestingly, CD18−/− PC efficiently migrate into the BM when adoptively transferred into the blood, providing profound in vivo evidence that CD18 is involved in PC egress from LN. CD18−/− mice were bred under specific pathogen-free conditions on a mixed 129Sv × C57BL/6J background or a C57BL/6J genetic background (12). Experiments with both strains produced comparable results. All animal experiments have been approved by the local government. Mice were immunized s.c. into the lateral flank three times at days 0, 8, and 14, applying 100 μg of Ag plus 0.5 μg of cholera toxin in 100 μl of PBS. Ags were either highly haptenized 4-hydroxy-3-nitrophenyl acetyl (NP21-CGG; Biosearch Technologies) coupled to chicken γ-globulin (Calbiochem) or DNP-conjugated human albumin (Sigma-Aldrich). Flow cytometry has been described elsewhere (13). To detect IgG+ LN cells, cells were fixed with 2% paraformaldehyde, permeabilized with 0.1% saponin, and stained with biotinylated rat anti-mouse IgG1 (A85-1), IgG2a (R19-15), IgG2b (R12-3), or IgG3 (R40-82) followed by streptavidin-PerCP or streptavidin-PE-Cy7 (all from BD Biosciences). To identify NP21-CGG-specific PC, permeabilized cells were stained with Cy5-labeled 4-hydroxy-3-nitrophenyl acetyl chicken-γ-globulin (NP4-CGG) or Cy5-labeled controls (BSA or OVA). Additional Abs used were as follows: anti-CD19 (6D5; BioSource International), anti-CD138 (281-2), anti-B220 (RA3-6B2; BD Biosciences), anti-IgD-Cy5 (HB250), anti-CXCR4 (2B11; Ref. 14), and anti-CXCR5 (2G8). Immunohistological analysis of LN was conducted as described earlier (13). Abs used were as follows: anti-ICAM-1 (3E2), anti-VCAM (51-10C9), anti-mucosal addressin cell adhesion molecule 1 (MAdCAM-1) (MECA 367; all BD Biosciences), anti-CD31 (390; Caltag Laboratories), anti-IgM (HB88), and anti-CXCL12 (R&D Systems). Anti-CXCL12 binding was visualized using a tyramid amplification system (NEN). The total number of IgG1+ PC and NP4-CGG-specific IgG1+ PC was determined by ELISPOT assay. In brief, ELISPOT plates (Millipore) were coated overnight at 4°C with either anti-IgG1 (A85-3) or NP4-CGG at 1 μg/ml in 100 μl of PBS. Plates were blocked with 10% FCS in RPMI 1640 and freshly isolated cells were added in medium at various concentrations and incubated overnight at 37°C. IgG1 was detected by biotinylated anti-IgG1 Ab (A85-1) followed by a streptavidin-conjugated peroxidase and chromogenic substrate. Cells were either isolated from cervical LN (cLN) of nonimmunized wild-type (WT) and CD18−/− animals or the draining peripheral LN (pLN) of immunized mice. T cells were depleted by complement lysis using anti-CD3 Ab (17A2) according to manufacturer’s instructions (Cederlane Laboratories). Non-T cell populations from WT and CD18 mutants were labeled with either 5 μM CFSE or 10 μM TAMRA (Molecular Probes) for 10 min at 37°C. A mixture of 4 × 107 CFSE and 4 × 107 TAMRA-labeled cells was injected i.v. into syngenic WT recipients. 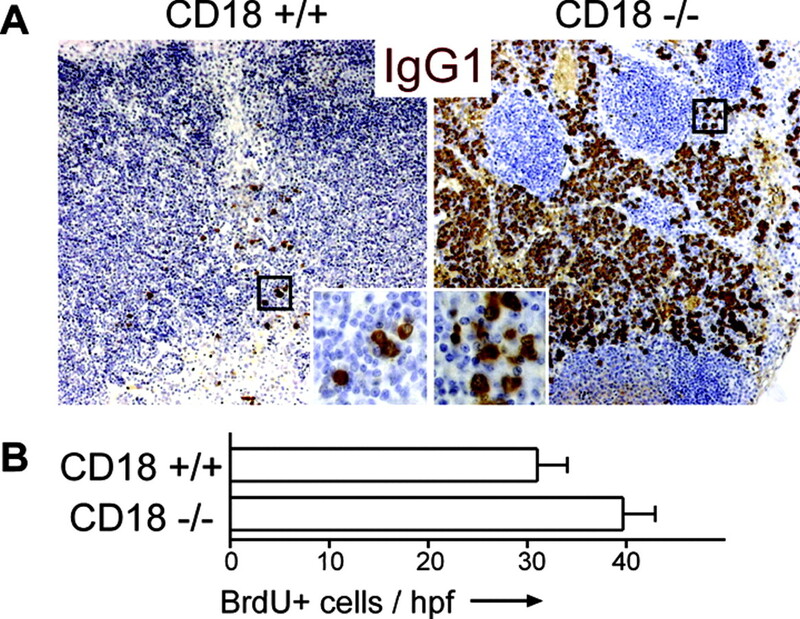 Twenty-four hours after injection, the ratio of WT:CD18−/− IgG1+ cells in the BM of the recipients was determined by flow cytometry. Ratios were corrected for the ratio of both cell population present in the injected mixture. In the present study, we addressed the role of β2 integrins in positioning and migration of PC. 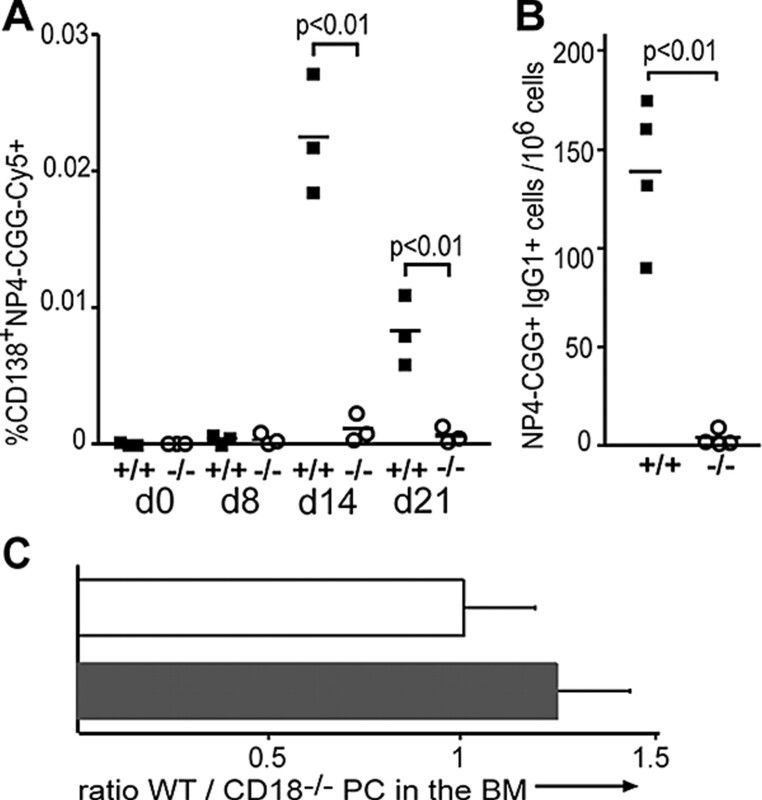 We first analyzed newly generated PC in WT mice immunized with NP21-CGG. After 3 wk serial sections through the draining inguinal LN were analyzed for the presence of PC (Fig. 1⇓A). Using immunofluorescence microscopy, we identified few IgG+ cells scattered along the medullary cords that were absent in the corresponding regions in nonimmunized controls (Fig. 1⇓A and data not shown). A fraction of the IgG+ cells stained with the fluorescently labeled Ag (NP4-CGG-Cy5) on cryosections but not with the control proteins BSA-Cy5 or OVA-Cy5 (inset in Fig. 1⇓A and data not shown). This suggests that newly generated PC localize to medullary cords before they egress from LN. Newly generated PC localize to ICAM-1+PECAM-1+CXCL12+ medullary cords. A, Three weeks after immunization, the inguinal LN were monitored for the presence of Ag-specific PC. PC could be identified sporadically along LN medullary cords, which is the area between the two red dotted lines. Some of these PC bound the Ag NP4-CGG-Cy5 (inset in A). B, In contrast to naive B cells (dashed line, gate on CD19+IgD+ cells), PC (solid line, gate on CD138+IgD− cells) lack CXCR5 expression in WT as well as CD18−/− mice. Shaded areas depict isotype control staining. Conversely, in both strains CXCR4 is up-regulated on PC in comparison to B cells. C and D, ICAM-1/CD31 and ICAM-1/CXCL12 colocalization, respectively. Images are depicted as single as well as merged double stainings. The corresponding regions for C and D are indicated in A. Scale bars, 200 μm in A and D and 100 μm in C.
Immunohistology of pLN sections revealed a prominent expression of ICAM-1 but not VCAM-1 or MAdCAM-1 on medullary cords (Fig. 1⇑C and data not shown). ICAM-1 expression substantially overlaps that of the endothelial marker PECAM-1/CD31 (Fig. 1⇑C), indicating that ICAM-1high structures in the medullary cords include lymphatic endothelial cells. We also noted that CXCL12 is largely restricted to ICAM-1+CD31+ structures (Fig. 1⇑D), whereas its receptor CXCR4 is highly expressed by PC (Refs. 7 and 8 and Fig. 1⇑B). Thus, it is tempting to speculate that the interaction of ICAM-1 with β2 integrin might mediate the positioning of PC within medullary cords. We next compared the number of IgG1-secreting cells in pLN and cLN of WT mice. Consistent with the notion that cLN are permanently activated due to irritations in the oral cavity, we observed a noticeable population of IgG1-secreting cells in cLN but not pLN of healthy WT mice (24 ± 10 IgG1+ cells per cLN vs 0.4 ± 0.1 IgG1+ cells per pLN; 24 LN of 6 animals analyzed). We also performed immunohistology on sections of cLN from untreated WT and CD18−/− mice kept under non-specific pathogen-free conditions. Although sporadic IgG+ cells could be observed along the medullary cords of cLN from WT mice, there was a massive increase in the number of IgG+ cells in cLN of CD18 mutants only sparing B cell follicles (Fig. 2⇓A), resembling the situation described for PC in mice deficient for P- and E-selectin (15). To rule out that this accumulation is attributable to increased cell proliferation caused by elevated IL-6 levels in CD18 mutants (12), we monitored BrdU incorporation but found no significant difference in the number of proliferating cells between WT and mutant mice (Fig. 2⇓B). PC also accumulate in the cLN of CD18/IL-6 double-deficient animals (data not shown), demonstrating that the effect observed in CD18 mutants is not caused by elevated IL-6 levels. Conversely, it is more likely that the increased numbers of PC substantially contribute to the elevated production of IL-6 in reported in CD18 mutants (12). Accumulation of PC in the cLN of CD18−/− mice. A, Paraffin sections of untreated cLN from WT and CD18−/− mice were stained with anti-IgG1 (brown). Nuclei were visualized by hematoxylin staining. Insets, Higher magnification of the indicated area. B, WT and CD18−/− mice were injected with BrdU to label proliferating cells. The number of BrdU+ cells was counted on paraffin sections through cLN. Bars represent the mean of eight cLN each. Error bars represent the SEM. Because of the permanent presence of foreign material in the intestine, IgA-secreting cells are continuously generated in or pass through the mLN, resembling the scenario in cLN. Interestingly, neither flow cytometry nor immunohistology revealed an increase of IgA+ PC in the mLN of CD18−/− mice when compared with WT animals (data not shown). PC of the intestine express α4β7 integrin (16) and its ligand MAdCAM-1 is prominently expressed in mLN but not pLN. Therefore, integrins other than β2 might be involved in regulating the emigration of IgA+ cells from this organ. Subsequently, we examined the Ag-induced accumulation of PC. Expectedly, we failed to identify a significant population of PC in inguinal LN of nonimmunized WT mice. In contrast, in CD18−/− mice, these LN already harbor a small population of CD138−IgG+ PC (Fig. 3⇓A, day 0). Upon immunization in both WT and CD18−/− animals, substantial amounts of CD138+IgG−, CD138+IgG+, and CD138−IgG+ PC were observed at day 8, with higher percentages of cells with a PC phenotype in CD18−/− animals compared with WT mice (Fig. 3⇓A, day 8). Independent of the genotype, comparable proportions of all PC populations were specific for NP4-CGG-Cy5 (Fig. 3⇓B and data not shown). Analysis of sections through the draining LN revealed that the localization of newly formed PC was undistinguishable in WT and CD18-deficient mice, with PC localizing to the medullary cords (Fig. 3⇓B, day 8). It has been suggested that redistribution of PC within the LN is governed by down-regulation of CXCR5 and CCR7 and up-regulation of CXCR4 (7, 8). In line with this observation β2 integrin deficiency did not impair down-regulation of CXCR5 and up-regulation of CXCR4 (Fig. 1⇑B), and β2 integrin-deficient PC migrated toward the CXCR4 ligand CXCL12 in in vitro Transwell migration assays comparable to WT PC (data not shown). At time points beyond day 8 after immunization, the CD138+IgG− population decreased and after 3 wk only CD138−IgG+ PC could be detected in WT animals. (Fig. 3⇓). In contrast, in CD18−/− animals, both CD138+ populations decreased only moderately over the time period investigated. 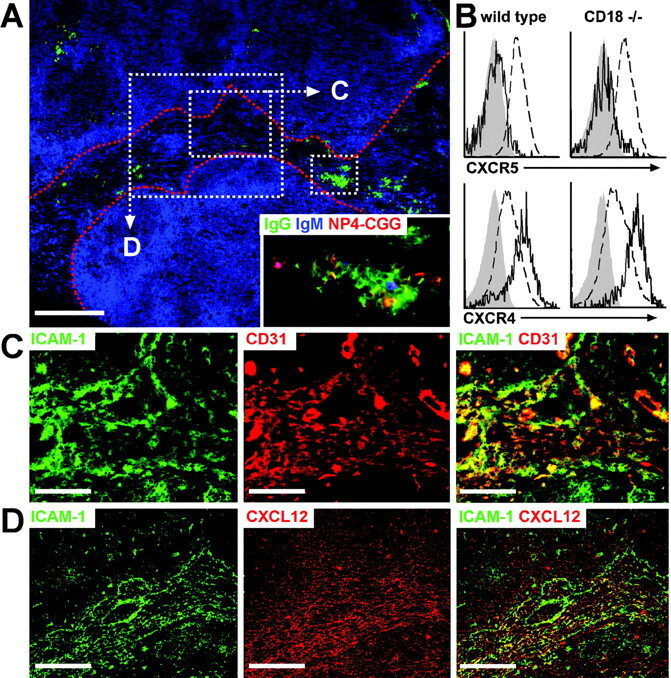 Thus, similar to the situation in the cLN, CD18−/− PC are trapped within the inguinal LN upon immunization, most likely due to an intrinsic defect in their ability to leave the organ. 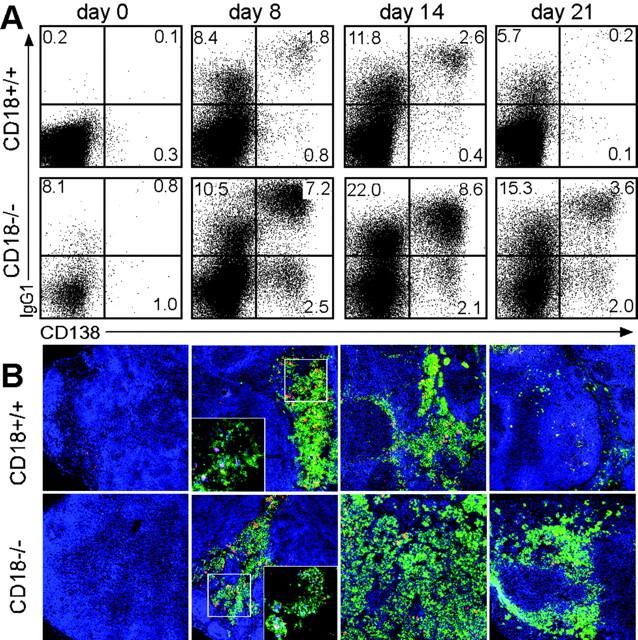 Data obtained from these kinetic experiments also suggest that the PC differentiation program runs through distinct steps progressing from CD138−IgG− naive B cells to CD138+IgG− cells, CD138+IgG+ double-positive cells, and finally to CD138−IgG+ PC. A comparable model postulating distinct PC subsets based on the expression of B220 and CD138 has been proposed by Underhill et al. (17), with CD138low to neg PC representing the most mature cells. Retention of PC in pLN of CD18−/− mice following immunization. Inguinal LN sections from WT or CD18−/− mice were analyzed at the indicated time points following immunization with NP21-CGG. A, Cells were stained for CD138 and cytoplasmic IgG1; numbers indicate the percentage of cells in each quadrant. B, Immunofluorescent analysis for IgG1 (green), IgM (red), and nuclei (blue) of WT and CD18−/− mice at various time points after immunization. Insets in the second column show at a higher magnification for IgG1 (green), IgM (red), and binding of NP4-CGG-Cy5 (blue) analyzed on subsequent sections of those shown in the main photograph. In contrast to IgA-secreting PC that preferentially migrate into mucosal tissues, the majority of IgG-secreting PC finally lodge within the BM. To find out whether the accumulation inside the LN is paralleled by reduced numbers of mature PC in the BM of CD18−/− mice, we quantified newly generated CD138+IgG+NP4-CGG-Cy5+ PC in the BM of WT and CD18−/− animals that were immunized as described above (Fig. 4⇓A). In WT as well as CD18−/− mice, flow cytometry failed to identify such cells in the BM before and 8 days after immunization. However, at days 14 and 21 of the immune response a significant population of these cells could be detected in the BM of WT but not in CD18−/− animals (Fig. 4⇓A). Interestingly, at day 14 a higher proportion of CD138+IgG+NP4-CGG-Cy5+ PC could be identified than at day 21. This could be because of the presence of short-lived PC at earlier time points or, more likely, reflects the ongoing differentiation of CD138+ to CD138− PC. These results were confirmed by ELISPOT analysis of NP-CGG-specific IgG1-secreting cells in the BM of WT and CD18−/− mice 2 wk after immunization (Fig. 4⇓B). CD18−/− PC fail to accumulate in the BM. A, Newly immigrated Ag-specific PC are severely reduced in frequency in CD18-deficient BM when compared with WT controls. At the time points indicated, the frequency of Ag-specific PC in the BM of WT (▪) and CD18−/− (○) mice was determined by flow cytometry. B, Enumeration of NP-specific IgG+ PC by ELISPOT present in the BM of WT (▪) and CD18−/− (○) mice 14 days after immunization confirmed reduced numbers of PC in the mutants. C, CD18−/− cells effectively migrate to the BM of WT recipients. Cells were either isolated from cLN of nonimmunized WT and CD18−/− animals (open bar) or the draining pLN of immunized mice (filled bar). WT and mutant cells were fluorescently labeled with either CFSE or TAMRA and injected i.v. into WT recipients. Bars represent the corrected (see Materials and Methods) ratio of WT- and CD18−/−-derived IgG1+ PC in the BM 24 h after adoptive transfer. To rule out that the lack of PC in the BM of CD18−/− mice might result from an intrinsic defect of CD18−/− cells to settle in the BM, we performed adoptive transfer experiments. WT and CD18−/− cells were isolated from cLN and after T cell depletion fluorescently labeled with TAMRA or CFSE. Mixtures of equal cell numbers (4 × 107cells each) were transferred i.v. into WT recipients. Importantly, 24 h later the same ratio of WT:CD18−/− PC used for the transfer could be detected in the recipients′ BM (Fig. 4⇑C, open bar), demonstrating that CD18-deficient PC migrate into the BM as efficiently as WT PC. The same experiment was performed with cells isolated 14 days after immunization from the draining LN of WT and CD18−/− mice. In accordance with the previous results, CD18−/− PC were not significantly impaired in their migration into the BM (Fig. 4⇑C, filled bar). We conclude that the migratory defect of CD18−/− PC confines to the process of LN emigration, since PC homing beyond the LN exit seems not affected by lack of CD18. So far sphingosin-1-phospate receptor 1 signaling has been revealed as a key regulator for lymphocyte egress from pLN (18). The identification of β2 integrin as an essential molecule involved in PC egress adds another piece to this part of the cell migration puzzle and substantiates the concept of emigration as an actively regulated transfer across a barrier. The precise nature of the barrier between the medullary cords and the efferent lymph is unknown, but it is widely accepted that egress from LN requires transendothelial migration (19, 20). Therefore, it is likely that, in analogy to immigration into LN via high endothelial venules, transendothelial migration into the lymph constitutes a central process in cell egress. It will be interesting to see how signaling of chemokines and spingosin-1-phosphate in concert with adhesion molecules, such as integrins, built up molecular machinery that controls cell egress. In summary, our data identify β2 integrin as a key molecule involved in PC migration. Newly generated PC migrate to LN medullary cords, possibly by CXCL12-mediated chemotaxis (4, 7) in a β2 integrin-independent manner. However, in contrast to WT animals, PC induced in CD18 mutants fail to egress from their site of generation and accumulate in the LN. We propose that the emigration of PC passing the medullary cord endothelium is directed by activated β2 integrin. We are especially grateful to Stefanie Willenzon for excellent technical assistance. ↵1 This work has been supported by Deutsche Forschungsgemeinschaft Grants SFB566-A14 (to O.P. and R.F.) and SFB497-C7 (to K.S.-K.). ↵3 Abbreviations used in this paper: LN, lymph node; BM, bone marrow; PC, plasma cell; cLN, cervical lymph node; mLN, mesenteric lymph node; pLN, peripheral lymph node; WT, wild type; MAdCAM-1, mucosal addressin cell adhesion molecule 1; NP21-CGG, 4-hydroxy-3-nitrophenyl acetyl; NP4-CGG, 4-hydroxy-3-nitrophenyl acetyl chicken-γ-globulin. Van der Vieren, M., H. Le Trong, C. L. Wood, P. F. Moore, T. St John, D. E. Staunton, W. M. Gallatin. 1995. A novel leukointegrin, αdβ2, binds preferentially to ICAM-3. Immunity 3: 683-690. Hynes, R. O.. 1987. Integrins: a family of cell surface receptors. Cell 48: 549-554. Kishimoto, T. K., N. Hollander, T. M. Roberts, D. C. Anderson, T. A. Springer. 1987. Heterogeneous mutations in the β subunit common to the LFA-1, Mac-1, and p150,95 glycoproteins cause leukocyte adhesion deficiency. Cell 50: 193-202. Cyster, J. G.. 2003. Homing of antibody secreting cells. Immunol. Rev. 194: 48-60. Kunkel, E. J., E. C. Butcher. 2003. Plasma-cell homing. Nat. Rev. Immunol. 3: 822-829. Hargreaves, D. C., P. L. Hyman, T. T. Lu, V. N. Ngo, A. Bidgol, G. Suzuki, Y. R. Zou, D. R. Littman, J. G. Cyster. 2001. A coordinated change in chemokine responsiveness guides plasma cell movements. J. Exp. Med. 194: 45-56. Wehrli, N., D. F. Legler, D. Finke, K. M. Toellner, P. Loetscher, M. Baggiolini, I. C. MacLennan, H. Acha-Orbea. 2001. Changing responsiveness to chemokines allows medullary plasmablasts to leave lymph nodes. Eur. J. Immunol. 31: 609-616. Bowman, E. P., N. A. Kuklin, K. R. Youngman, N. H. Lazarus, E. J. Kunkel, J. Pan, H. B. Greenberg, E. C. Butcher. 2002. The intestinal chemokine thymus-expressed chemokine (CCL25) attracts IgA antibody-secreting cells. J. Exp. Med. 195: 269-275. Hauser, A. E., G. F. Debes, S. Arce, G. Cassese, A. Hamann, A. Radbruch, R. A. Manz. 2002. Chemotactic responsiveness toward ligands for CXCR3 and CXCR4 is regulated on plasma blasts during the time course of a memory immune response. J. Immunol. 169: 1277-1282. Pabst, O., L. Ohl, M. Wendland, M. A. Wurbel, E. Kremmer, B. Malissen, R. Forster. 2004. Chemokine receptor CCR9 contributes to the localization of plasma cells to the small intestine. J. Exp. Med. 199: 411-416. Scharffetter-Kochanek, K., H. Lu, K. Norman, N. van Nood, F. Munoz, S. Grabbe, M. McArthur, I. Lorenzo, S. Kaplan, K. Ley, et al 1998. Spontaneous skin ulceration and defective T cell function in CD18 null mice. J. Exp. Med. 188: 119-131. Forster, R., E. Kremmer, A. Schubel, D. Breitfeld, A. Kleinschmidt, C. Nerl, G. Bernhardt, M. Lipp. 1998. Intracellular and surface expression of the HIV-1 coreceptor CXCR4/fusin on various leukocyte subsets: rapid internalization and recycling upon activation. J. Immunol. 160: 1522-1531. Underhill, G. H., H. A. Minges Wols, J. L. Fornek, P. L. Witte, G. S. Kansas, H. A. Minges-Wols. 2002. IgG plasma cells display a unique spectrum of leukocyte adhesion and homing molecules. Blood 99: 2905-2912. Farstad, I. N., T. S. Halstensen, A. I. Lazarovits, J. Norstein, O. Fausa, P. Brandtzaeg. 1995. Human intestinal B-cell blasts and plasma cells express the mucosal homing receptor integrin α4β7. Scand. J. Immunol. 42: 662-672. Underhill, G. H., K. P. Kolli, G. S. Kansas. 2003. Complexity within the plasma cell compartment of mice deficient in both E- and P-selectin: implications for plasma cell differentiation. Blood 102: 4076-4083. Cyster, J. G.. 2005. Chemokines, sphingosine-1-phosphate, and cell migration in secondary lymphoid organs. Annu. Rev. Immunol. 23: 127-159. Gretz, J. E., A. O. Anderson, S. Shaw. 1997. Cords, channels, corridors, and conduits: critical architectural elements facilitating cell interactions in the lymph node cortex. Immunol. Rev. 156: 11-24. Kaldjian, E. P., J. E. Gretz, A. O. Anderson, Y. Shi, S. Shaw. 2001. Spatial and molecular organization of lymph node T cell cortex: a labyrinthine cavity bounded by an epithelium-like monolayer of fibroblastic reticular cells anchored to basement membrane-like extracellular matrix. Int. Immunol. 13: 1243-1253.